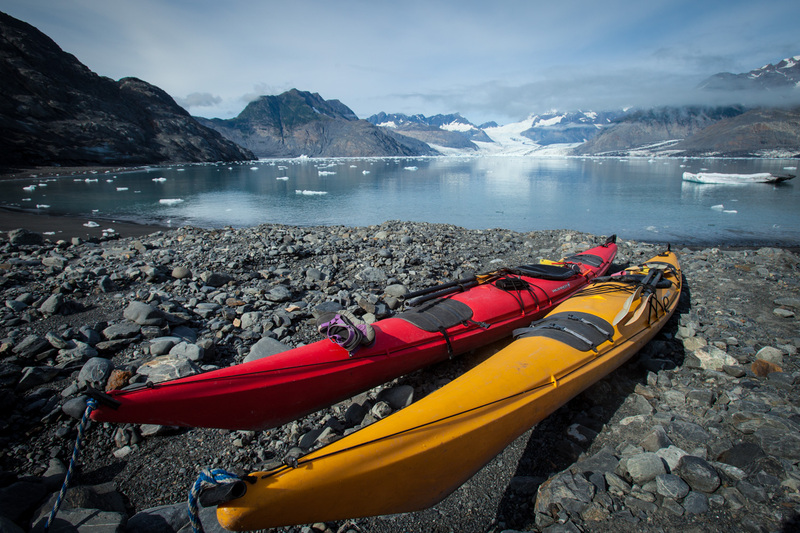 Kayak rentals in Prince William Sound, without guides, are available for experienced paddlers who have both cold water and self rescue experience. Valdez offers great kayaking opportunities for either day trips or extended tours. You can choose to start a trip right from the harbor, or we can help arrange a water taxi for remote drop off and pick up. Rentals are only available from our shop in Valdez, and we do not allow our renters to transport our kayaks by auto or trailer. SELF RESCUE ... Renters must be able to demonstrate, on land, the proper techniques for a self rescue. If you cannot demonstrate a self rescue properly you will be required to take a lesson in which you'll need to prove you can be safe on the water. This is for your safety and required by our insurance. All Rentals are required to carry a VHF marine radio and flares. Radios and flares are available for rent. You are also required to carry a chart or map of the area. This is for your safety. Before departing for any rental you will be required to write down your planned itinerary. We teach basic techniques to be able get back into your kayak if you tip over. We show you how to use a "paddle float" to assist in the self rescue. We start with an on-land demonstration, then put on dry suits to practice in the water. We have each student paddle out to demonstrate the technique and practice with our instructor supervision. Pangaea Adventures offers customized clinics based on individual interests and goals. Clinics can last from 1/2 day to multiple day outings. Each course is set up on an individual basis. If you are interested in exploring Prince William Sound and would like to take care of your own meals and you have all of your own camping equipment, then you might be interested in a Guided Rental. A guided rental is when you rent kayaks from Pangaea Adventures and then hire a guide to show you the way and act as a safety net. You set your own itinerary, bring your own camping equipment, and prepare your own meals. NOTE: Guided Rentals are not suggested for groups with minimal camping experience. If you are new to camping, we suggest a fully outfitted tour. The following agencies offer Public Use Cabins in the Valdez area. Each cabin is accessible by water. You can either kayak to the cabins or hire a water taxi for a remote drop-off and pick up. Alaska Marine State Park Cabins Located in Shoup Bay: 10 miles from Valdez : $70 peak per night per cabin. You can make online reservations with Levitation 49 by clicking here. Occupancy of Forest Service cabins is by permit only ($50-$60 per night per party). Reservations may be made up to 180 days in advance either online by clicking here, or by calling (877)444-6777. Pangaea Adventures offers Water Taxi Services to these cabins from late May through early September. Ask us about our guided trips to these cabins!